At YWCA Greenwich, we seek to inspire a passion for learning through a variety of summer camps and after-school programs offered throughout the year. Our top-rated preschool education has students from over 14 countries. Our friendly and experienced educators have made it their goal to provide children of various economic and ethnic backgrounds with a strong foundation for kindergarten. 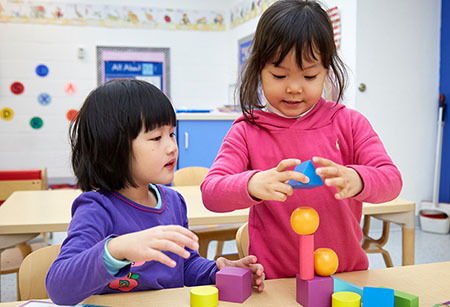 At the Steven and Alexandra Cohen Preschool Center, an international student body between the ages of 15 months to 5 years experience a unique early learning curriculum that builds a strong platform for a life-long love of learning. Our preschool is a world of learning, laughter and love for your children. They offer a beautiful, modern, spotless facility - right in the heart of Greenwich - and a community of trained educators who care about your child's development and well-being. The goal at the Steven and Alexandra Cohen Preschool Center is to make your child happy, confident, eager-to-learn and well-prepared for Kindergarten. Our objectives are to create activities based on your child’s individual needs and interests that provide a foundation for language and reading skills, as well as other academic pursuits. At YWCA Greenwich, we are dedicated to bringing out the lifelong learner in every child. We believe that children can acquire social, intellectual, emotional and physical skills in a setting where the process of learning is an adventure. Our experienced teachers encourage children to be independent, active, confident and creative explorers. Children are always allowed to progress in their own way and at their own pace. Our focus is also on teaching students good habits and attitudes that lead to a positive sense of self. In this way, children learn how to be “at home” with themselves, with preschool staff, within their families and with the world around them. The two most important elements of the preschool curriculum are helping children get along well with others and preparing them to become enthusiastic learners. Our teachers are dedicated to helping children learn important fundamental concepts and enabling them to teach themselves throughout their lives. The curriculum accomplishes this by creating purposeful and productive play experiences throughout the day. In addition, children learn the skills necessary to socialize in a group of peers, or develop individual friendships, without the presence of a parent. YWCA Greenwich Preschool is set on a lovely 6.5 acre site in central Greenwich. Annually renovated to meet upgraded standards, it contains large classrooms and areas for childhood learning. Rooms are specifically designed to facilitate development at each age and state. It is a safe, happy and clean environment that permits childrent to learn at their own pace. A nurturing experience where children learn to separate, build early socialization skills and advance through play, discovery, exploration, and observation. The process is unhurried and encourages emotional and physical development. Creative preschool at its best in an atmosphere rich in experiences, concepts, and ideas. The focus is on a developmentally appropriate curriculum and activities that encourage the social, emotional, cognitive and physical development of the child. Teaching methods encourage intellectual growth and creative expression. The result is a child who is fully prepared for kindergarten, and beyond. A full-day (7:30 am - 6:00 pm), 5-day-per-week, 49-week program that offers the same curriculum as Tinker Tots. This program is ideal for working parents. We take pride in offering our students a learning experience that provides a unique curriculum taught by a community of educators who care deeply about every child’s development. Visiting our facility is the first step in deciding whether the YWCA Preschool is right for you and your child. Click through below to schedule a tour! During your visit, you will tour the facility, see all the classrooms and spend time receiving answers to all your questions. Note: Space is limited. Completion of this application form is the first step in registering your child for YWCA Greenwich Preschool, but it does not guarantee a space or grade placement. Address: 259 East Putnam Avenue, Greenwich, CT 06830. Here at YWCA Greenwich, we are proud to mean many things to many different people. Founded in 1919, YWCA Greenwich has grown into a treasured community asset, making a difference in the lives of others each day. We offer over 125 programs each year, with activities and fitness classes for children from age 6 months and extending to seniors. Our beautiful facility is located on 6.5 acres in the heart of Greenwich, CT and includes a heated pool, a new fitness center, locker rooms, steam room, sauna, as well as the only water playground in town. We encourage our members to stay active with programs for every interest. We even have a nationally ranked competitive swim team with over 200 members. YWCA Greenwich is home to Greenwich’s only pitching machine and softball batting cage system. In addition to our outdoor sports fields, we also have new state-of-the-art indoor facilities. It is here that we host our all ages fitness classes as well as our youth sports programs, including an all-new power spin class complete with top-of-the-line, Star Trac Blade Ion Spinner Cycles. Empowering women and girls for over 35 years, YWCA Greenwich has been the sole provider of free domestic abuse services for our community. We offer counseling, community education, as well as divorce support groups. If you or someone you love needs help or a compassionate ear, please call our hotline at 203-622-0003. Dedicated to improving our community in Greenwich, CT, we also have partnerships with several local action groups, as well as police, area hospitals, and local businesses which have allowed us to form and lead community education and justice initiatives to eliminate racism in our community. 93% of every dollar we earn goes directly to our programs that benefit women, children, and families in the Greenwich area.